so they only aired one??? how stingy!! So what do think about today's performance? although i'm happy for boa for her triple crown win, i hope we can see se7en win triple with his follow-up song or better, his song from his full-length album which i hope isn't too far away. 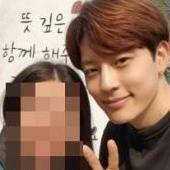 as you guys know, se7en changed his hairstyle. i guess it's because he's preparing for a different song. on music bank though he put it up so it was hard to see. i personally like it. what do you guys think? i got it from dc gallery. i'm not too sure what kind of event he was attending. His hairstyle doesn't look too different in those pictures after all! The most of Korean FAN object it. If the rumor is true,it seems to become a fuss. My friend hates her. Actually, there are a lot of FAN so. I want to believe that this rumor is a lie. but in my, when they write an article about PHB, they don't write Park Han Buyl in the title, they say "Se7en's girlfriend". The fact that she is thought of not as herself but as someone's lover doesn't make us really happy. Why is that? We just think she is not enough for someone like Se7en. very right. Another thing if a fan leaves an artist just cuz he's going to have his girl in his mv then that's plan stupid and I rather have that fan leave too cuz they weren't a real fan of his music from the beginning. yeah, i read literally pages of panic on other sites about the rumored possibility of phb in se7en's follow up song mv but i didn't bring it here because obviously it's not confirmed yet. although i never thought well of the fans who left se7en after he revealed his relationship with phb, i think if he does agree to shoot a mv with phb at this point in his career he himself will be mainly to blame if he loses all his fans. se7en should very well know at this point that his fans, even though they have stayed by his side knowing he has a girlfriend, don't like phb at all, so shooting a mv with her while knowing his fans' dislike of her would not be appreciative of his fans' feelings. i trust that se7en knows better than that and that at a time like this when his career really cannot handle another big crisis, he won't agree to something that will make his fandom almost completely disappear. as for why lucky 7s don't like phb, i think it's partly simply because she has had se7en for the past 8 years. this is just what i think though. and also, to be honest, while se7en was in america and phb was in korea answering people's questions about their relationship after it was revealed, there were times when she said stuff that really irked the lucky 7s. this is again just my guess but i think the lucky 7s see phb as someone who doesn't really care about se7en's fans and doesn't act very considerate of se7en's career as an artist. Is Se7en really gonna have PHB in his new MV??? NO WAY! I believe Se7en isn't reckless to the point to have his GF in his MV. He, himself, said that he lost many fans because he revealed their relationship so NO, I don't think Se7en or his company are this stupid.. I mean, even when people ask him about her he ignores the questions!